Mix the ricotta cheese and parsley. Meanwhile, mix canola oil, milk, egg and salt for the sauce. Place one Turkish yufka on a flat surface and spread the 1/3 of the sauce all over it equally. Place the second yufka on top and spread the ricotta mixture over evenly. Then, place the third yufka over and spread the other 1/3 of the sauce all over. Roll it over to a long log. Cut it in half and leave in the freezer for up to 2-4 hours. Then, take the rolls out of the freezer and slice them in ½ inch thick and place over a greased oven tray. 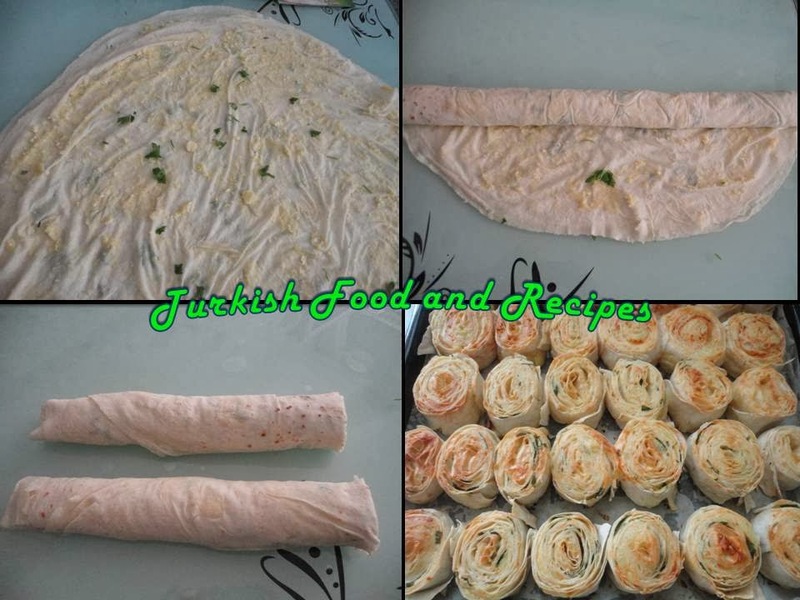 Add the yogurt to the remaining sauce, mix and spread it all over the borek slices. Bake them in the preheated 400F (200C) oven for 30-40 minutes or until they turn golden brown. Lor peynir ve maydanozu karistirin. Sos malzemeleri olan; sut, kanola yagi, yumurta ve tuzu cirpin. Yufkanin birini masaya yayin ve sos karisimin ucte birini uzerine yayin. Uzerine ikinci yufkayi yayin ve her yerine esit olacak sekilde lorlu ic malzemeyi yayin. En ustune son yufkayi yerlestirin ve sos malzemesinin 3 e boldugunuz 2. kismini yayin. Son kalan 3. kisim firina vermeden once boreklerin uzerine yayilacak. Son olarak, ust uste koydugunuz yufkalari uzun bir rulo olacak sekilde gevsek bir sekilde sarin. Ruloyu ortadan ikiye kesin ve buzlukta 2-4 saat kadar bekletin. Buzluktan cikan rulolari 1-2 cm kalinliginda dilimleyin ve yaglanmis firin tepsisine yerlestirin. Uzerlerine geriye kalan sosa 1 kasik yogurdu ekleyin ve boreklerin uzerine kasikla dokun. Onceden isitilmis 200C (400F) firinda yaklasik 30-40 dakika uzerleri kizarana dek pisirin. 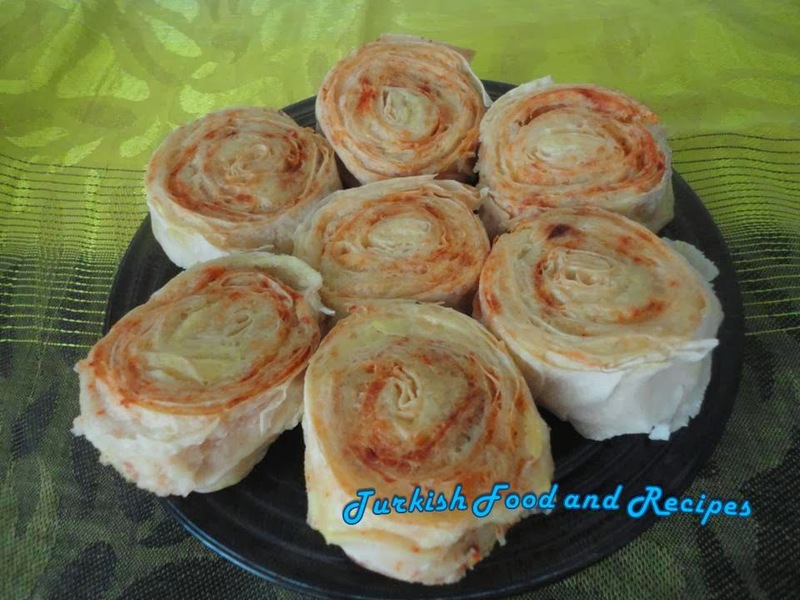 Can I make this using phyllo dough? Can I make this sung a phyllo dough? You should be able to make it using phyllo pastry. It should be in sheet form, as its important for the pastry to be thin. I just stumbled upon your blog while I was searching for Turkish recipes. I am so glad that I found your site with all of your wonderful recipes. My father's family were from Turkey and I can remember family gatherings with the most delicious foods imaginable. Sadly, my father passed away when I was very young and the wonderful recipes seemed to have vanished over the years. Thank you for creating such a beautiful blog filled with recipes, that for me, bring back wonderful memories. Thank you so much for sharing your recipe! I made it today. Absolutely delicious!